Stock market is expected to open flat lower on Tuesday. Its still not ready for sell off or major correction yet. In order for market to correct. 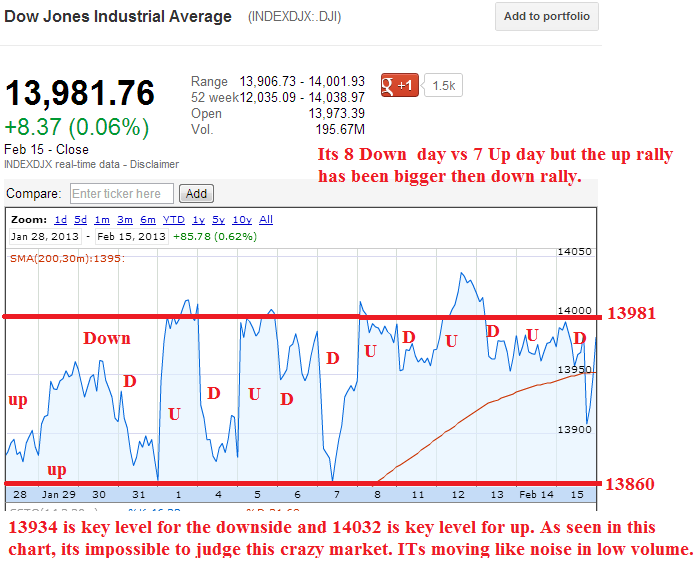 It need to close below 13934 and S&P500 need to close below 1514. 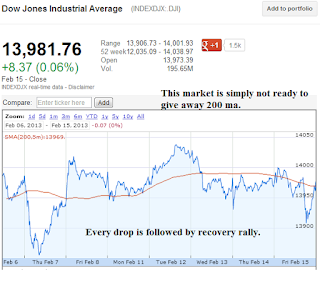 It doesnt mean stock market will rally either. Today Gold and Silver sold off eventhough US dollar index was flat. Multiple time, Vix, Equity, Gold, Silver were red, and its impossible to judge the direction of the side way market. Avoid this market. Be in cash or use trailing stop if your long. Every drop is followed by sharp rally. 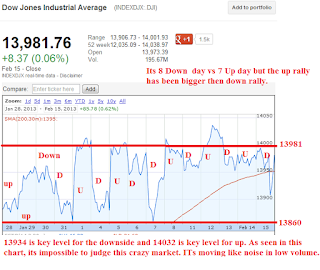 Very Difficult to trade this flat low volume market as stock moved in tight range. Medtronic, Inc. ( MDT ) is reporting for the quarter ending January 31, 2013. The medical products company's consensus earnings per share forecast from the 19 analysts that follow the stock is $0.91. This value represents a 8.33% increase compared to the same quarter last year. In the past year MDT has met analyst expectations three times and beat the expectations the other quarter. Zacks Investment Research reports that the 2013 Price to Earnings ratio for MDT is 12.85 vs. an industry ratio of 12.70, implying that they will have a higher earnings growth than their competitors in the same industry. Genuine Parts Company ( GPC ) is reporting for the quarter ending December 31, 2012. The auto (truck) company's consensus earnings per share forecast from the 7 analysts that follow the stock is $0.93. This value represents a 8.14% increase compared to the same quarter last year. GPC missed the consensus earnings per share in the 3rd calendar quarter of 2012 by -0.89%. Zacks Investment Research reports that the 2012 Price to Earnings ratio for GPC is 17.48 vs. an industry ratio of 16.40, implying that they will have a higher earnings growth than their competitors in the same industry. NiSource, Inc ( NI ) is reporting for the quarter ending December 31, 2012. The electric power utilities company's consensus earnings per share forecast from the 6 analysts that follow the stock is $0.44. This value represents a 41.94% increase compared to the same quarter last year. NI missed the consensus earnings per share in the 4th calendar quarter of 2011 by -13.89%. Zacks Investment Research reports that the 2012 Price to Earnings ratio for NI is 18.56 vs. an industry ratio of 8.30, implying that they will have a higher earnings growth than their competitors in the same industry. Westlake Chemical Corporation ( WLK ) is reporting for the quarter ending December 31, 2012. The plastics company's consensus earnings per share forecast from the 9 analysts that follow the stock is $1.25. This value represents a 212.50% increase compared to the same quarter last year. WLK missed the consensus earnings per share in the 4th calendar quarter of 2011 by -39.39%. Zacks Investment Research reports that the 2012 Price to Earnings ratio for WLK is 16.54 vs. an industry ratio of 19.40. Cimarex Energy Co ( XEC ) is reporting for the quarter ending December 31, 2012. The oil (us exp & production) company's consensus earnings per share forecast from the 18 analysts that follow the stock is $1.08. This value represents a -20.59% decrease compared to the same quarter last year. Zacks Investment Research reports that the 2012 Price to Earnings ratio for XEC is 16.32 vs. an industry ratio of 16.60. Windstream Corporation ( WIN ) is reporting for the quarter ending December 31, 2012. The wire line company's consensus earnings per share forecast from the 12 analysts that follow the stock is $0.13. This value represents a -31.58% decrease compared to the same quarter last year. Zacks Investment Research reports that the 2012 Price to Earnings ratio for WIN is 18.54 vs. an industry ratio of 40.40. Yandex N.V. ( YNDX ) is reporting for the quarter ending December 31, 2012. The internet content company's consensus earnings per share forecast from the 4 analysts that follow the stock is $0.27. This value represents a 35.00% increase compared to the same quarter last year. YNDX missed the consensus earnings per share in the 1st calendar quarter of 2012 by -13.33%. Zacks Investment Research reports that the 2012 Price to Earnings ratio for YNDX is 30.92 vs. an industry ratio of 28.50, implying that they will have a higher earnings growth than their competitors in the same industry. Westinghouse Air Brake Technologies Corporation ( WAB ) is reporting for the quarter ending December 31, 2012. The transportation company's consensus earnings per share forecast from the 9 analysts that follow the stock is $1.31. This value represents a 36.46% increase compared to the same quarter last year. In the past year WAB has met analyst expectations once and beat the expectations the other three quarters. Zacks Investment Research reports that the 2012 Price to Earnings ratio for WAB is 18.69 vs. an industry ratio of 12.00, implying that they will have a higher earnings growth than their competitors in the same industry. Rockwood Holdings, Inc. ( ROC ) is reporting for the quarter ending December 31, 2012. The chemical company's consensus earnings per share forecast from the 7 analysts that follow the stock is $0.48. This value represents a -47.25% decrease compared to the same quarter last year. ROC missed the consensus earnings per share in the 2nd calendar quarter of 2012 by -1.68%. Zacks Investment Research reports that the 2012 Price to Earnings ratio for ROC is 14.91 vs. an industry ratio of 14.00, implying that they will have a higher earnings growth than their competitors in the same industry. Omnicare, Inc. ( OCR ) is reporting for the quarter ending December 31, 2012. The medical services company's consensus earnings per share forecast from the 7 analysts that follow the stock is $0.85. This value represents a 46.55% increase compared to the same quarter last year. In the past year OCR has beat the expectations every quarter. The highest one was in the 3rd calendar quarter where they beat the consensus by 7.5%. The "days to cover" for this stock exceeds 17 days. Zacks Investment Research reports that the 2012 Price to Earnings ratio for OCR is 11.90 vs. an industry ratio of 22.10. Sealed Air Corporation ( SEE ) is reporting for the quarter ending December 31, 2012. The construction company's consensus earnings per share forecast from the 9 analysts that follow the stock is $0.29. This value represents a -30.95% decrease compared to the same quarter last year. Zacks Investment Research reports that the 2012 Price to Earnings ratio for SEE is 20.40 vs. an industry ratio of 15.50, implying that they will have a higher earnings growth than their competitors in the same industry. Armstrong World Industries Inc ( AWI ) is reporting for the quarter ending December 31, 2012. The building company's consensus earnings per share forecast from the 12 analysts that follow the stock is $0.32. This value represents a 100.00% increase compared to the same quarter last year. Zacks Investment Research reports that the 2012 Price to Earnings ratio for AWI is 22.96 vs. an industry ratio of 25.30.